Does a modular design make this the best smartphone around? For the first time in a while, everyone was very excited when LG announced the G5 earlier this year at MWC. It's been ages since a big smartphone manufacturer has done something different and innovative. How has LG stirred things up? With a semi-modular design, and innovative dual camera of course! 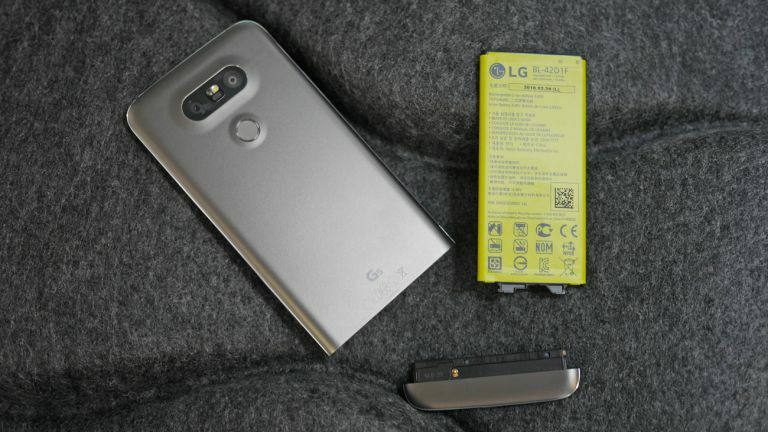 In terms aesthetic design, the LG G5 is probably the worst looking flagship smartphone in 2016. In my opinion. It's not terribly hideous or anything, it's just quite bland. The way the top edge of the screen tapers off is a nice touch, the camera array resembles robot eyes, and everything is nicely curved, but the metallic plastic edging looks cheap. In fact, the whole design feels cheaper than most rivals, the aluminium just doesn't feel the same quality. It's quite large, at 149.4 x 73.9 x 7.7mm, but it feels nicely balanced in the hand. If you can get past the looks (which is very easy to do), it's a very comfortable phone to hold, and feels solid, no way near as fragile as the Samsung Galaxy S7. While the G5 doesn't resemble the G4 all-that-much, it carries over the rear power button design, but this year the button also contains a fingerprint sensor. This has both positive and negative points, the location is natural finger placement when holding the phone, but if you try to unlock when the phone resting on a desk, then it becomes a slight annoyance. The front is mostly taken up by the large 5.3-inch screen. It's a great looking quad HD (14440 x 2560) display with a 554 PPI pixel density, but the colours and saturation can't quite match the Samsung Galaxy S7's vibrant panel. LG uses a Super ISP display, which is 'always on' by default, showing the time and notifications. The real key feature in the design of the LG G5 is its modularity - with the ability to slide out the base and add optional attachments. This allows you to switch the battery, add a camera module, or a high-res audio module, with more 'Friends' to come. We can't imagine LG are going to sell many of these Friends, based on their price and limited use. But it still makes LG's G5 the most innovative and exciting smartphone of 2016, with every other smartphone manufacturer playing it very safe so far. The G5 is the only flagship smartphone in 2016 that still has a removable battery, so that's a selling point right there. Thanks to that removable battery, the G5 isn't waterproof like the Samsung or Sony. One final point to mention about the design is the lack of soft or hard navigation keys. If you want to go home, back or multitask you'll have to swipe up on screen if you're in fullscreen mode, which is annoying. Comparing performance of flagship smartphones seems pretty pointless in 2016, they're all very fast, indiscernible-y so in everyday use. The LG comes packing a Snapdragon 820 octa-core processor, 4GB RAM and 32GB of storage (which is expandable via MicroSD). We didn't have any problems with performance during our review, apps and web pages open very quickly and switching between them is breezy. LG's UI is quite cartoonish, but it's relatively inoffensive. The most interesting thing about UI is that LG has chosen to get rid of the app drawer, instead having all apps on the home screen. This can be added back though LG Smartworld, though, if you're a massive App Drawer fanboy. The battery is 2,800mAh, which is good for around a day. The battery is a little smaller than its rivals (the S7 has a 3,000mAh unit), and that does show, with the G5 sometimes dying on me early evening. The battery is charged via a USB-C port, and is complete with Quick Charge 3.0, which tops up to around 80-percent in 30 minutes. Another interesting, innovative feature of the G5 is the dual camera. While we've seen a dual camera before in various smartphones, including the HTC M8, this one is with a twist. The primary camera is a 16MP sensor with 'normal' field of view. This takes really good-looking images, but they're a little dull compared to the S7. The second camera is an 8MP sensor with a much wider field of view. This takes much more dynamic and interesting images compared to regular smartphones. As you can see, it create a GoPro-esque fisheye image, and allows you to squeeze a lot more into the frame. I actually found myself using the ultra-wide angle sensor more, but it's incredibly simple to switch between the two settings, and certainly a useful innovation in our eyes. One slight problem with the wide field of view is that you often get a finger creeping in at the bottom of the shot. I like the LG G5 a lot, it's a real joy to use. Not because it's a perfect smartphone, but because it's innovative. If you want a 'stand out' smartphone to make a geeky statement, the G5 is it. The modular design is interesting, and the ability to swap the battery is key for some. The innovative camera is the real winner here, with the ability to switch between normal and ultra-wide angle, really taking smartphone photography to the next level. The design is bordering on dull, and the modular design could be deemed gimmicky, but if you want the most interesting smartphone in 2016 - the LG G5 is perfect (because it's not perfect).